Flat and fast, the Dresden Half Marathon is a great way to both sightsee and race. Runners follow a loop course around the city center and will travel past sights such as the Erich Kastner Museum, one of the largest and best preserved Gründerzeit (the 19th-century industrial age) quarters in Europe, St. Martin’s Church, the largest park in Dresden, and plenty of views of the Elbe River. This October race also features other distances such as a marathon and a 10K. 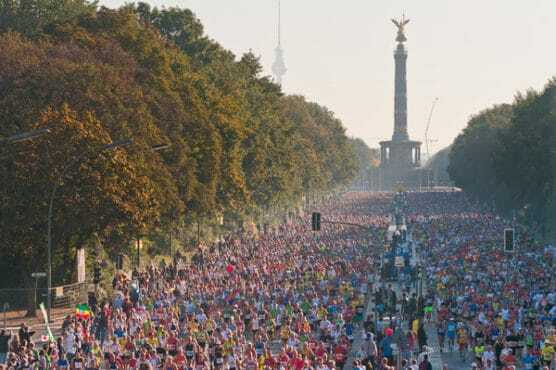 The Generali Munich Half Marathon starts in the district of Bogenhausen on Denninger Strasse and the course heads south along the original marathon route to the Olympic Park, where the highlight is running through the Marathon Arch into the Olympic Stadium. Runners have 3 hours to complete this point-to-point, mid-October race. If racers have a time goal, pacers will be available for 1:30, 1:45, 2:00, and 2:15 finishing times. Just as the iconic finish of the full marathon, the Berlin Half Marathon will allow runners incredible views of the Brandenburg Gate. Flat and fast, this early April half marathon takes runners through downtown Berlin on a loop course. Fun fact: 1,502 inline skaters participated in the 2018 event! The course of the mid-October Halbmarathon Leipzig starts at the most famous landmark of the city, the Völkerschlachtdenkmal Leipzig, the monument to the Battle of Nations. The loop course take runners past the Galgenberg monument, along the Markkleeberger Lake, and through the recreation park Lößnig-Dölitz, past the idyllic Silver Lake. Runners will finish the 13.1 miles back at the Völkerschlachtdenkmal Leipzig. The loop course of the Stadtwerke Düsseldorf Half Marathon includes much of the green space in downtown Düsseldorf. Runners will start along Konigsallee and make their way through the Hofgarten Park before completing the loop for 13.1 miles. The race has over 30 years’ worth of history and runners can also participate in a 5K or 10K instead of the half marathon distance. If you are looking for something different from a big city half marathon, register for the Royal Castle Romantic Half Marathon, held in July. The two loop course goes through the old town of Fussen (and over cobblestone streets!) and through the Schwanseepark King Ludwig II where two royal palaces are visible above Lake Schwansee. This race has a 4:00 PM start so be prepared to enjoy a midsummer afternoon running amongst the Alps and castles. Now in May, the Stuttgart Half Marathon begins in Stuttgart Neckar Park and finishes in the Mercedes-Benz Arena. Runners will take to the streets Stuttgart on a loop course with large portions along the Neckar River. The course is best described as rolling hills as runners will ascend over 600’ in 13.1 miles. The Haspa Half Marathon Hamburg is a sightseeing tour of the city! Runners will start at the Hamburg Congress Center as pass by sights such as the patriarchal St. Pauli landing stage, the Elbe Philharmonic Hall, through the Wallring Tunnel, into the famous district Rotherbaum, and finishing back at the Hamburg Congress Center in front of the Television Tower. Held in late April, this scenic course is not to be missed. Runners of the fast and flat RheinEnergie Half Marathon will not be disappointed in this course. The course winds its way through downtown Cologne, looping from Otto Square and traveling through historic neighborhoods along the Rhine River. This mid-October race has less than 50’ of elevation gain and offers paces for 1:30, 1:45, 2:00, 2:15, and 2:30 finishing times. Starting and finishing in Commerzbank-Arena, the loop course of the Frankfurt Mainova Half Marathon is mostly flat in the first half and has a few rolling hills in the second half of the course. Runners will travel entirely on the south side of the Main River during this early March race that begins at 10:05 AM for non-elite athletes.